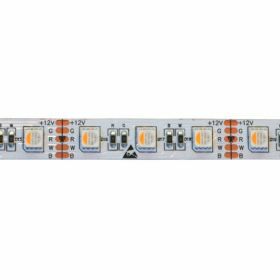 This wall plate RGBW controller is designed for controlling any 12V or 24V RGBW colour-changing product on a DMX512 system, such as our LED RGBW strip light. It has a clean modern look with its glass touch panel, and it emits a pleasant sound to indicate when a touch has registered - however this can be turned on/off (muted) simply by pressing and holding the power button until it sounds. A blue indicator light shows just above the power button when the unit is powered off so that it is easy to locate in the dark. Run up to 4 zones of lighting products. Please note that this does not fit into a standard wall socket box. It is supplied with an 86 type switch box which is installed into the wall beforehand - this product is recommended for new builds or renovations where new GIB board will be installed. Retrofitting an 86 box into the wall will be difficult as the touch panel only just covers the hole the panel is recessed into. This unit comes with mounting screws. The top 4 keys change between the 4 different zones available. Control the brightness of a single colour up and down, or change the speed of fade/flash between colours in the colour-changing modes using the 'SPEED/BRT' key to the right hand side of the colour dial. Set it to a specific colour at any time simply by selecting the desired colour on the colour wheel dial, or set to red, green, blue, or white mode by pressing the one of the colour keys along the bottom of the panel, and change the brightness of these colours by pressing and holding these keys. Change to a mode and scroll through the different modes by pressing the mode key to the left of the colour dial. This will also jump back to the last mode set when pressed after having set a single colour on the colour wheel dial. Use this controller with our flexible RGBW strip light.